For more: Daily Mail photos, Zimbio gallery. For more: Article from the BBC, video embedded below. The Queen talks much about this year of remembrance, including the centenary of World War I. The photos on the table are of her grandparents, King George V and Queen Mary, who were king and queen back in 1914, and the brass box sitting in front would have been filled with presents for the troops back then as part of an effort organized by their daughter, Princess Mary. Her selection of a brooch which came to her via Queen Mary has a bit of additional significance in that context. The Cambridge Pearl Pendant has made several appearances in Christmas broadcasts past, most recently appearing in 2012 and 2004. She's gone slightly fancier for this occasion, abandoning her usual earrings and triple strand of pearls for the larger version of those earrings, also from Queen Mary, and a longer double strand of pearls (as you'll see from the post linked below, I rarely attempt to differentiate between her many, many pearl necklaces). 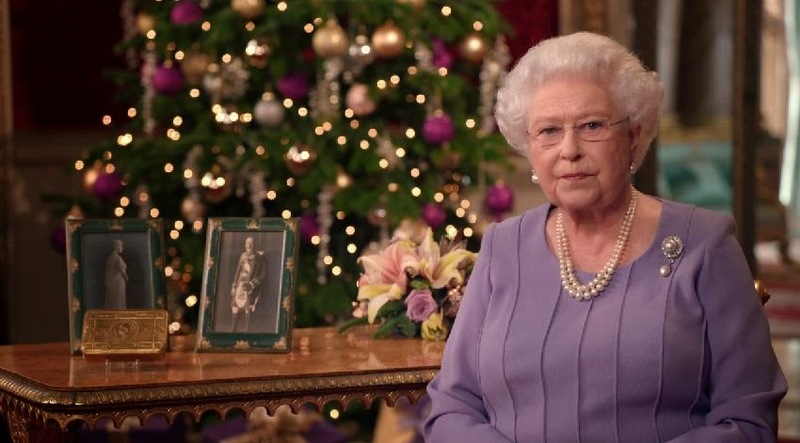 Very elegant, and on a final and tremendously superficial note...bonus points from me for a purple outfit and purple ornaments to match!